We’ve all been there—that message you’ve been waiting for is finally found in the depths a Gmail spam folder. It seems like the most you can do is move it to the inbox,“report as NOT spam”, and chuck it up to bad luck. It’s just one message, right? Because it’s so rare and elusive, this bounce should immediately raise some serious red flags about the domain’s reputation as a sender. You’ll likely find that a large percentage of all your messages are being rejected by Gmail (including many domains managed in G Suite). Rebuilding that reputation after this kind of bounce also becomes much harder, as those affected recipients won’t even have the option to correct Gmail by moving it to their inboxes. The first step is identifying there’s a problem. To better monitor reputation-related Gmail bounces in Postmark, we recently made some changes to make them more visible in your account. Now they’ll show up immediately as an “ISP Block”, which you can use to gauge Gmail performance and deliverability more directly. Some may speculate that a change in content here or there would solve the issue, but then you remember that Google’s approach to sifting through and displaying content is arguably the most advanced in the world, learning from mistakes and trends in realtime. Beyond that, it boasts of catering to the individual experience, adapting its filtering processes to match a single user’s preferences. That means in addition to monitoring bounces, always keep a close eye on engagement metrics. If a low percentage of people are opening and clicking, Gmail may start to think these messages aren’t so important. If some people are also marking the messages as spam, Gmail will view them as unsolicited. This combination of low open/click rates and high abuse complaints affects the domain’s reputation as a sender. Just as this negative engagement can ruin sender reputation, positive engagement over time can build it back up again. Use your transactional mail and other high-engagement streams to target those most active contacts, increasing your overall engagement rate and training spam filters like Gmail’s to more fully trust your messages. Of course, it’s also possible to get blocked very quickly, usually because of some kind of mistake on the sender’s end. Maybe an integration malfunctioned and sent the wrong content, perhaps a spammer was able to use the domain to send spam, or possibly a bot exploited some web forms to facilitate a denial-of-service attack. 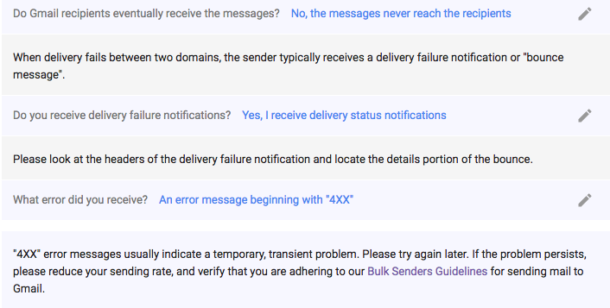 These large bursts of unwanted messages with an increase in spam complaints makes Gmail take urgent and aggressive steps to prevent the messages from harming others. So don’t become a victim yourself. Be proactive about who can use and trigger messages on your signup forms. It’s easier than ever to implement state-of-the-art security steps and invisible captchas on websites, with little effect on the overall user experience. Another option is to only show the captcha when a form is accessed multiple times via the same IP/user. Beyond that, try not to make collecting your customers’ email addresses a required step. When people get frustrated, they’ll fill in any random information to proceed, often leading to emailing a spamtrap that will get your future messages blocked. Next set up a DMARC policy on your domain, which not only enforces that fraudulent messages are to be rejected, but sends you valuable reports about nefarious activity originating from your own domain. If a spammer exploits a vulnerability, you’ll quickly have the data you need to begin securing the threat to your sender reputation. Finally, be responsive to detected reputation shifts. The best and easiest gauge is registering your DKIM domain with Google Postmaster Tools. This toolset shares data from Gmail directly about how your messages are performing each day, including domain and IP reputation metrics. We even have a handy guide on how to interpret and respond to this reputation data, so no guesswork around whether your hard work is paying off! In a nutshell, Gmail just wants to make the internet a more enjoyable and safer place for their customers. By respecting your recipients’ inboxes and keeping your assets secure, Gmail blocks will be a thing of the past.